Dr Saurabh Rai took ownership of our Gosnells clinic in 2016. However, he is not new to the field of dentistry. He completed his Bachelor of Dental Science in 2004 in Bangalore, India, followed by his Master of Science in Forensic Science from the University of Western Australia. During this time, he also completed his Australian Dental Council licensing exams from the University of South Australia in Adelaide. Being a dentist is something that he deeply enjoys, both professionally and personally. 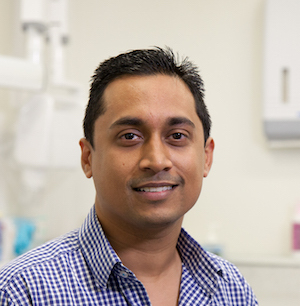 His extensive experience and training in areas of dental implantology, root canal treatments and wisdom tooth removal has allowed our Gosnells practice to expand the range of services that are available to our patients. Each year, Dr Saurabh completes a number of continuing education courses, including training in dental implant procedures, laser dentistry, splints and the Inman Aligner system. Dr Saurabh enjoys spending time with family, reading and maintaining ancient coins from all over the world. He is also working to get his private pilot’s license.